Roundabout Quilters: Village Fabrics signed up for our show! We are delighted that Village Fabrics have agreed to come to our show as a trader. Village Fabrics is a leading supplier of patchwork and quilting fabrics and supplies. Visit Yvonne to find an extensive range of fabrics, including Christmas fabrics and advent calendars. They have an exclusive range of kits and patterns, all designed by their in-house designers and they have a new kit available most months. You can sign up to our block of the month programmes. 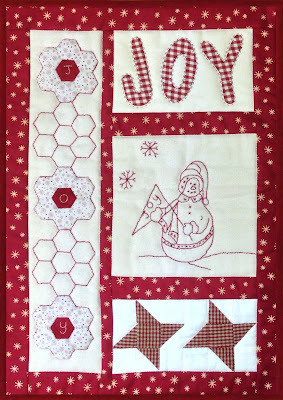 Come and see their latest block of the month, Village EPP Sampler, which is a hand sewn and hand quilted project, featuring English Paper Piecing, appliqué and embroidery.